Samsung Electronics today announced a new addition to the Galaxy tablet portfolio, the Galaxy Tab A (8.0’’), an everyday, versatile tablet designed for the entire family. The Galaxy Tab A builds on the Galaxy design legacy, featuring a refined look and feel with a sleek, metal body and smooth rounded edges making it comfortable to hold. It offers long-lasting battery, a beautiful display that looks good in any light, and increased onboard memory with expandable storage. Daily family life can get hectic, so the Galaxy Tab A strives to add convenience with the new Home Mode, which can be configured to show up to three displays, providing a quick glance at information like the time, family calendar, weather or photos even while the device is charging. Each family member can have their own login with Multi User Mode to securely save their favorite settings and apps. With Parental Controls, parents can set limits on usage and customize available content to create a fun and safe environment for younger users. Also, users can easily view their favorite apps and content on personalized Bixby3 Home screens. Just in time for the holiday season, the new Galaxy Tab A will be available in select markets and offered in Wi-Fi or LTE models in Black, Silver and Gold. For more information about the Galaxy Tab A (8.0’’), visit http://www.samsungmobilepress.com, news.samsung.com/galaxy or www.samsung.com. 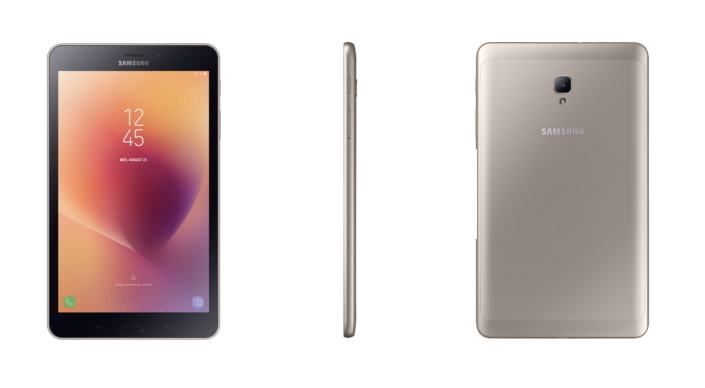 1The new Galaxy Tab A (8.0”) offers longer video play time of up to 14 hours, and is equipped with a 5,000 mAh battery, compared to 12 hours and 4,200 mAh battery on the Tab A (2015, 8.0’’). 3Does not support Bixby Voice and Bixby Vision at this time. Bixby capabilities may vary by market. 4Eight apps, valued at approximately $28 USD will be available. However, apps available with the Value Pack may vary by country. 5YouTube Red is a paid streaming subscription service, currently available in the U.S., Australia, Mexico, New Zealand and Korea.